Today the church tends to depict Pentecost with abstract forms—intense colors of red and orange, perhaps cascading from the ceiling of the church or painted as swirling forces to suggest the power and presence of the Holy Spirit. Historically the church has pictured the scene as a assembly of people clustered in a small room with flames of fire over each head, with Mary, the mother of Jesus, positioned in the center of the gathering, usually in a posture of prayer. 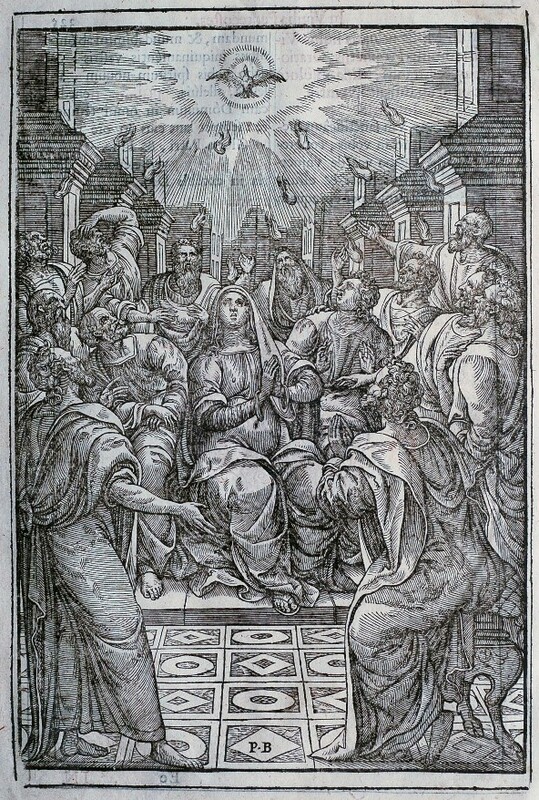 Even though the New Testament clearly states that Mary was present at Pentecost, most people are surprised to discover her in depictions of the event. This 1626 wood engraving by the Flemish artist, Pieter van der Borcht II (1545 – 1608), is a fragment from a Missale (liturgical book with text for worship) and clearly fits this established tradition. It was inserted into the Missale to help the viewer visualize the scene and encourage greater devotion. The artist carefully used perspective to give a sense of space and has skillfully drawn each participant to display emotion and movement. Van der Borcht has chosen to envision the very moment the Holy Spirit appeared. Light encircles the dove as rays stretch out in all directions with flames of fire emanating from its presence. While most of the apostles have their heads looking upward to the dove hovering near the top of the ceiling, there is a wide array of facial expressions and gestures. Many appear amazed, one older apostle in the middle raises his hands in praise, while in the foreground one disciple still has his hands folded in prayer. Mary is positioned in the center of the scene in a posture of prayer. What led the church to emphasize her presence at this important event that is considered the birth of the church? According to the Book of Acts, the apostles, with Mary and the other women, gathered with one mind in prayer to await the outpouring of the Paraclete. We see Mary as she prays imploring the gift of the Holy Spirit. Mary had a unique perspective of what was to happen. At the Annunciation the Holy Spirit had descended, overshadowing her, to bring about the Incarnation. Having had an encounter with the Holy Spirit she would have understood its significance and ardently longed for its presence in Jesus’ followers. As we gather to celebrate Pentecost this Sunday, may we await with the same expectation as the Apostles and Mary, the power and presence of the Holy Spirit. This large wood engraving of 13 ½ x 9 cm is thought to have been an engraving after a work by Pieter van der Borcht II. It was an illustration in a 1626 Missale published by Plantin, a book publishing company in Antwerp. Pieter van der Borcht II (1545 – 1608) was born in the city of Malines, southwest of Antwerp. By 1565 Borcht was working as an illustrator for Christopher Plantin, who had his press in Antwerp. In 1572 the Spanish Duke of Alva sacked the town in an attempt to maintain order and suppress Calvinist and other Reformation heresies. He moved his family to Antwerp. From his arrival there until his death he worked full time for Plantin, illustrating the many liturgical books the press produced. Van der Borcht was largely forgotten until relatively recently, when his work became more known through the Plantin archives at the Plantin-Moretus Museum in Antwerp. Bowden Collections offers twelve traveling exhibitions. Six that focus on a particular artist and six are developed around a theme. Mounting these shows is made easy because everything you need for a show is included: info for labeling; file for a handout; high-resolution images; and shipping information. Book now for the 2016-2017 Season. Learn more by visiting the website www.BowdenCollections.com.